The Zondervan Biblical and Theological Lectures series provides a unique audio learning experience. Unlike a traditional audiobook's direct narration of a book's text, The Triune God: Audio Lectures includes high-quality live recordings of college-level lectures that cover the important points from each subject as well as relevant material from other sources. 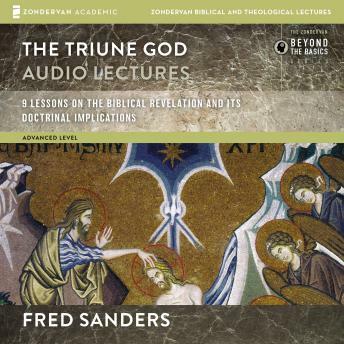 In The Triune God: Audio Lectures, theologian Fred Sanders offers thoughtful, concise, and understandable lessons that explore the biblical, creedal, and confessional shape of the doctrine of the Trinity. In particular, Sanders secures knowledge of the triune God in rightly ordered theological language. He presents conclusions about the Trinity based on the way the Trinity was revealed in Scripture. As such, this study offers theological principles for reading Scripture in a thoroughly Trinitarian manner. In contrast to other explorations of the Trinity that rush over the biblical discussion on the way to extended accounts of historical development, Sanders spends a significant amount of time on biblical exposition and drawing the theological implications from it. Throughout Sanders interacts with major voices from the history of the doctrine. His arguments are indebted to and informed by the great tradition of Trinitarianism. A healthy deference to doctrinal tradition is indispensable to serious theology, and this study is an exercise in retrieval. But the fitting way to retrieve the insights of the church fathers is not to pay more attention to them than to Scripture. The most patristic way to proceed toward a well-ordered doctrine of the Trinity is, after all, to study Scripture. The Triune God: Audio Lectures is part of the Zondervan Biblical and Theological Lectures series, which is dedicated to bringing expert teaching from world’s best theologians and biblical scholars directly to interested leaders. The Triune God: Audio Lectures offers the chance to learn about one of the central tenets of the Christian faith from one of today’s premier theologians.